Is Brighton & Hove Albion v West Brom on TV, what's the team news, what are the odds? Brighton entertain Championship side West Brom in the fourth round of the FA Cup on Saturday. The Seagulls reached the quarter-finals last season, before going out 2-0 away to Manchester United. Brighton reached the fourth round with a 3-1 win at Bournemouth, while West Brom overcame Wigan 1-0. The Seagulls go into the game on the back of a 2-1 Premier League defeat at Manchester United on Saturday, while West Brom won 2-0 at Bolton in the Championship on Monday. What time does Brighton v West Brom kick off? The FA Cup tie kicks-off at 3pm at the Amex. VAR will be in use for the game. No. Brighton are not on television again until the home match with Burnley on February 9. Highlights of Saturday's match will be on Match of the Day on BBC One from 10.20pm that evening. Brighton will probably field a similar line-up to the one which won 3-1 at Bournemouth in the third round. Jason Steele could make his first Amex appearance in goal, after impressing in the victory at the Cherries. Bruno, Shane Duffy, Leon Balogun and Gaetan Bong started in defence at Bournemouth. Seagulls boss Chris Hughton could decide to give Dan Burn his debut against West Brom. Anthony Knockaert has impressed off the bench in the last two games and is likely to start on the right wing. Beram Kayal is likely to come into central midfield, along with Yves Bissouma if the Mali international is fit to return from a hip injury. 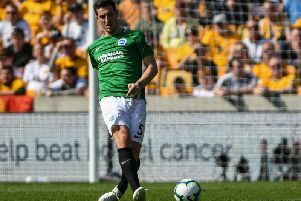 Swedish youngster Viktor Gyokeres could get a run out on the left of the front three if Jurgen Locadia is rested after starting Brighton's last seven matches. Florin Andone started and scored in the win at Bournemouth and the Romanian striker is likely to lead the line against West Brom. Mathew Ryan and Alireza Jahanbakhsh are with Australia and Iran at the Asian Cup. Both teams are through to the quarter-finals, which take place on Thursday and Friday. West Brom boss Darren Moore made nine changes as the Baggies won their third round tie 1-0 at home to Wigan. He is again likely to alter his side, with promotion back to the Premier League their main priority this season. West Brom are third in the table, three points behind second-placed Norwich and a further point behind leaders Leeds. Goalkeeper Sam Johnstone, defenders Craig Dawson, Ahmed Hegazi and Kieran Gibbs, midfielder Gareth Barry and strikers Jay Rodriguez and Dwight Gayle were among those rested for West Brom's third round win. The referee appointments for the fourth round weekend have not yet been announced. Brighton are the favourites to win on SkyBet at 5/6. The draw is 5/2 and a West Brom victory is 10/3. The Seagulls won 3-1 at home to West Brom in the Premier League last season and a repeat of that scoreline is 14/1. Brighton striker Glenn Murray is 3/1 to score first, with Florin Andone 10/3, Jurgen Locadia 9/2, Pascal Gross 7/1 and Anthony Knockaert 17/2. Murray is 21/20 to score anytime, with Andone 6/5, Locadia 13/8 and Knockaert 14/5. Dwight Gayle and Jay Rodriguez are both 11/2 to score first for West Brom, with Hal Robson-Kanu 8/1 and Bakary Sako 17/2. Gayle is 19/10 to net anytime, with Rodriguez 2/1, Robson-Kanu 14/5 and Sako 3/1.